For my money, David Lowery has been as much fun to watch as any filmmaker of his generation. He’s a veteran editor, and it shows in the sensibilities, qualities, and pacing of his previous trio of features, the curious line-up of “Ain’t Them Bodies Saints,” “Pete’s Dragon,” and “A Ghost Story.” Lowery has also directed episodic television, a whole bunch of short subjects, the 2009 feature “St. Nick,” and shares directorial credit with three others on the 2005 “Deadroom.” His newest, “The Old Man & the Gun,” starring the eternal Robert Redford, has received much attention for the claim that the Sundance Kid is hanging up his spurs as an actor, for good, with this movie. Redford may be receiving the lion’s share of attention for his easy-does-it portrayal of serial bank robber/jailbreak artist Forrest Tucker (a real-life true crime figure who died in 2004 at the age of 83), but Lowery takes his own impressive turn, simultaneously polishing the mythic status of Redford by giving the actor all the room he needs to roam and applying enough individual storytelling quirks to set the movie apart. The tale is set in the early 1980s, and the vintage mood is significantly enhanced by the use of Joe Anderson’s pretty 16mm photography. 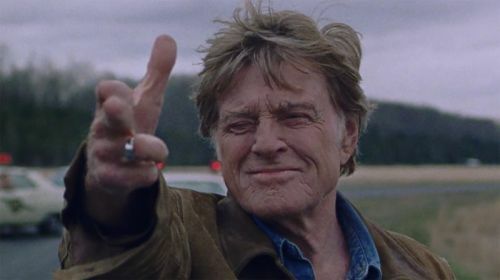 Even a cursory glance through the reviews of “The Old Man & the Gun” will turn up multiple instances of the word charming as descriptive of Redford, the film, or both. To that end, Lowery and his leading man delight in withholding much from the audience, leaving room for the kind of ambiguity that makes for open-ended interpretations of the motivations of a lifelong criminal with a courtly, gentlemanly sense of craft when it comes to separating banks from cash. Both Sissy Spacek’s Jewel, the woman Forrest courts, and Casey Affleck’s John Hunt, a weary cop tracking Forrest, probe their skepticism and contemplate the robber’s mysteries. Jewel adds the romance, Hunt adds the cops-and-robbers pursuit. Hunt’s daughter notes at one point, in words written by Lowery, that catching Forrest would mean an end to the quest. We can picture Lowery smirking behind the camera during the shooting of that scene. We also imagine Lowery taking just as much delight in presenting a wide range of appreciative tributes, nods, and homages to Redford’s past, from vintage photos and a clip from “The Chase” (beautifully repurposed in an escape montage) to a cameo appearance of the nose-swipe secret code gesture from “The Sting” and the opening title’s recollection of “Butch Cassidy and the Sundance Kid,” right down to the choice of typeface. Redford, Spacek, and Affleck command so much of our attention, it sometimes feels like the rest of the cast members -- including Danny Glover, Tom Waits, Tika Sumpter, and Elisabeth Moss -- are a little bit shortchanged. But I like to imagine they are all having a grand experience. And it’s a testament to Lowery’s skills that complex and fully realized lives are being lived. No matter the screen time, their contributions are meaningful. Lowery’s vibe throughout is so mellow -- oh, that perfect soundtrack placement of Jackson C. Frank’s “Blues Run the Game”! -- philosophers can mine the subtext at their own peril.